A comphrehensive 6-1 win for Leyton Orient saw the League 2 side see off Ryman Premier side Staines Town. 3 goals in the first 13 minutes killed off the tie early but former O’s defender Darren Purse did lob in against his former club to give Staines an ounce of hope. However Dean Cox curled in a free kick to make it 4-1 at the break. Staines gave it a go in the second half but Orient wrapped it up in the final minutes through John Marquis and Sean Clohessy. Orient manager Ian Hendon wanted a reaction from his side after a disappointing 1-0 defeat to Accrington last weekend. 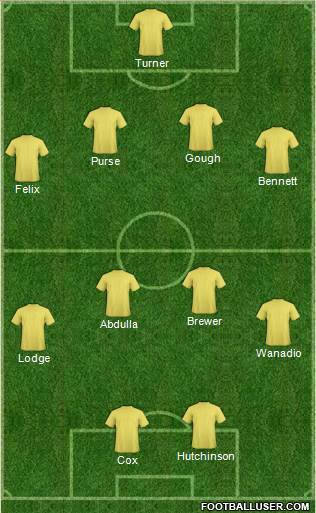 He made 5 changes with Dean Cox, Frazer Shaw, Lloyd James, Blair Turgott and Alan Dunne coming in. Staines who play in the Ryman Premier League were without a win since beating Gloucester City in the previous round included former O’s defender Darren Purse and their top scorer Pat Cox. In a scrappy start, neither side were getting a foothold on the ball due to the tricky conditions but it was Orient who struck first blood. The East London side have struggled in recent weeks to grab an early goal but today was different. After a flowing move, Dean Cox found an advancing Frazer Shaw down the left. The former West Ham trainee’s first cross was blocked but his second cross found the head of Ollie Palmer who could hardly miss from 3 yards out (well you say that). The O’s striker celebrated with a point to his watch, a celebration which seemed to see relief strike around Brisbane Road. The goal settled down the home side immediately as they were looking to prevent an FA Cup shock. Staines were struggling to find their feet going forward and were finding it hard to deal with the advancing Frazer Shaw. It was Shaw who provided Orient’s second, Jack Payne found space in the center and sent a through ball to Shaw. Shaw advanced, seeing Dean Cox’s pull out to the edge of the box, Shaw’s cross found Cox who angled his finish in to the bottom corner. Staines looked shell shocked and as soon as they kicked off after the second they were three behind. Blair Turgott nicked the ball, taking a long range effort on goal but visiting keeper Jack Turner could only palm in to the path of Ollie Palmer who netted his second of the day, to pretty much kill of the tie. With Orient 3-0 ahead, Hendon’s men sat a little deeper allowing Staines more space to go forward. Both visiting wingers were having some joy with Luke Wanadio the outlet ball on the left flank for Staines. It was Wanadio who nearly created Staines first goal, he was allowed space on the left hand flank. His in-swinging cross evaded everybody with Ashley Lodge inches away from tapping in a the back post. Then came the most disappointing part of the afternoon, Orient have only kept one clean sheet since August and today was no different. After a corner was poorly dealt with by Alex Cisak, it bounced out of the box but a Staines man headed it back into the danger area. Cisak punched poorly for the second time to Darren Purse and the former O’s defender looped his effort in to give Staines hope once more. However, the glimmer of hope only lasted for 8 minutes when Dean Cox curled in a wonderful free kick. After scoring one away at Dagenham and Northampton, there was only one man who was going to take the free kick and once more Cox curled in. With Dean Cox and Ollie Palmer both netting braces, Jay Simpson was looking to add his 11 goals this season. First he went close after he turned and swiveled on the edge of the box but Turner saved comfortably before Orient’s striker struck over from edge of the box. Cox nearly completed his hat trick with another fine move down the left, Simpson played in Cox but Lloyd James nicked the ball from Cox. James back-heeled to Cox however Turner was equal to Cox’s effort. The break of half time didn’t seemed to stop the home side attacking for more goals. Dean Cox who returned to the starting 11 after being left out in recent weeks nearly created Orient’s fifth. Orient’s number 7, weaved his way down the left, crossing for Lloyd James but somehow James headed well wide of the target from 6 yards. Palmer who netted in his first game since 18th August was inches away from grabbing his hat trick, after Simpson laid off to his strike partner, Palmer collected the ball. The former Mansfield man, set his sights but Turner once again palmed away the ball for a corner. Staines were still finding it hard to contain Orient who saw Simpson and Turgott have efforts saved by Turner. Hendon brought on two youngsters Scott Kashket and Freddy Moncur for Jack Payne and Jay Simpson. Both impressed after their introduction to the game with Kashket creating Orient’s fifth in the dying minutes. Kashket played a neat one two with Cox, he collected the ball playing a through ball to another substitute, John Marquis. Marquis touched forward and slotted home for his first goal for Orient after his loan move from Millwall. Orient completed the scoring in added time, Sean Clohessy advanced forward on the right flank and curled above Jack Turner to send Orient into round 2. A routine win for Ian Hendon’s men which was made easier with their 3 goals in the opening 13 minutes. Staines rarely troubled Orient’s defensively however the failure of a clean sheet will be really be infuriating to Hendon. Another poor mistake punished, currently Orient seem to be playing with the motto, “if you score one, we will score 2”. “Get a win under our belt” said Clohessy pre match and despite being against a team 80 places lower, a win is a win. With Palmer and Cox both netting braces, it should give them confidence ahead of next weeks trip to Hartlepool. The issue that is constantly being raised is the squad size which with Connor Essam and Paul McCallum is being challenge. With Jack Payne forced off with injury yesterday, the size of the squad is once again being challenged. Hendon called for more players ahead of next week, but Freddy Moncur and Scott Kashket staked their claim. The most pleasing performance yesterday was from MOTM Frazer Shaw. After losing his place to Adam Chicksen, he has been forced to sit on the bench. However after Adam Chicksen’s poor performance last week and him being sent back to Brighton: Shaw staked his claim. A real solid display from Shaw and looked a real threat going forward. Yes, I know, against Staines some of you will be saying but after having a hard time before he was dropped, Shaw seems to have relished his chance. I for one am really pleased for Frazer who I felt was harshly treated earlier in the season but after yesterday’s performance he really showed everybody how good he is. A win under the belt but defensive problems clear to see. The tests will come in the next three league games with York City at home and tough trip to Hartlepool and Plymouth. Orient will find out what they are made off in those games but it is clear Hendon needs to add to his squad before hand. Well after how poor last week’s performance, it was nice to see Orient score some goals but the truth is Orient will take any win to make round 3. It could have been a shock but Orient were professional, onwards and upwards to Hartlepool next week on a Sunday. Yes, cheers Sky for the extra money forked out for the trip, let’s hope it is worth it.